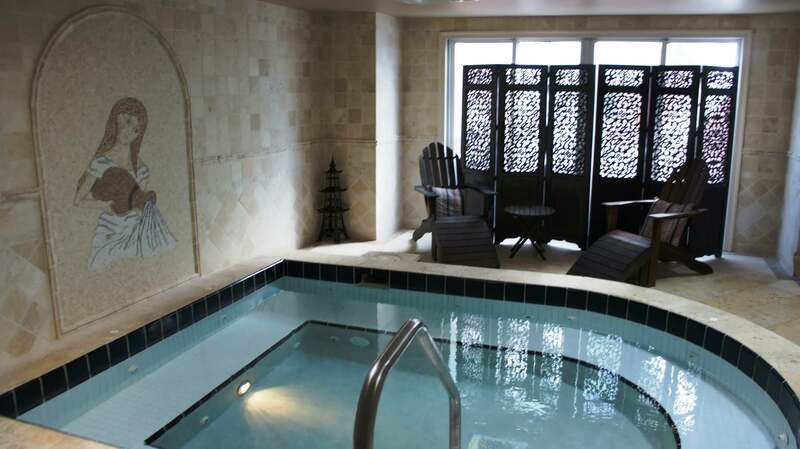 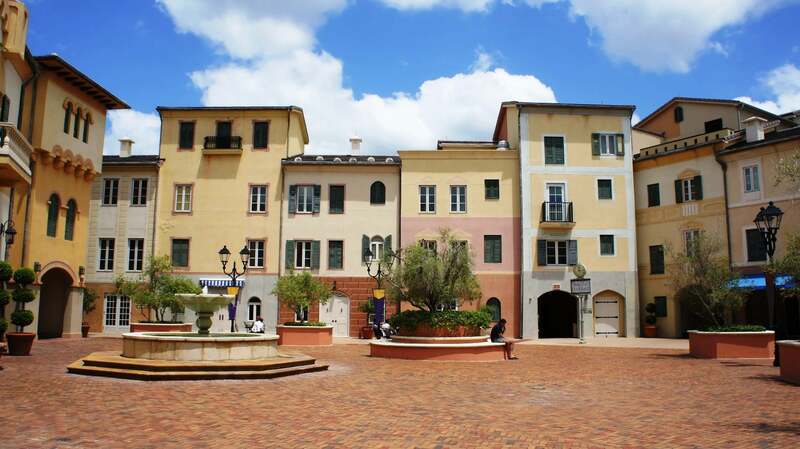 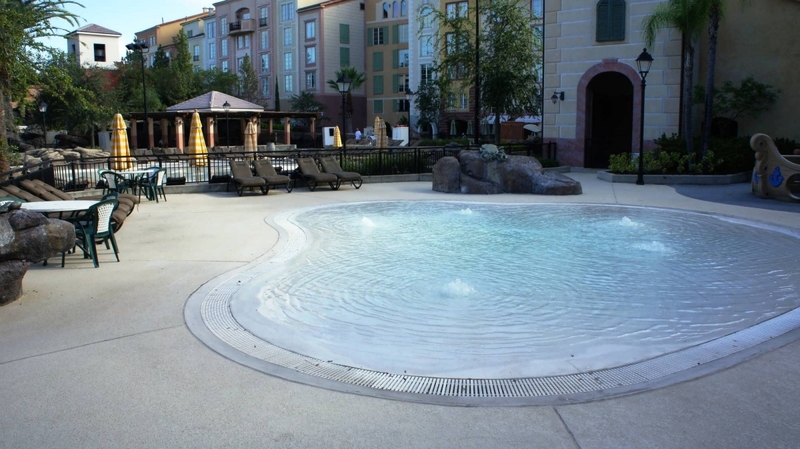 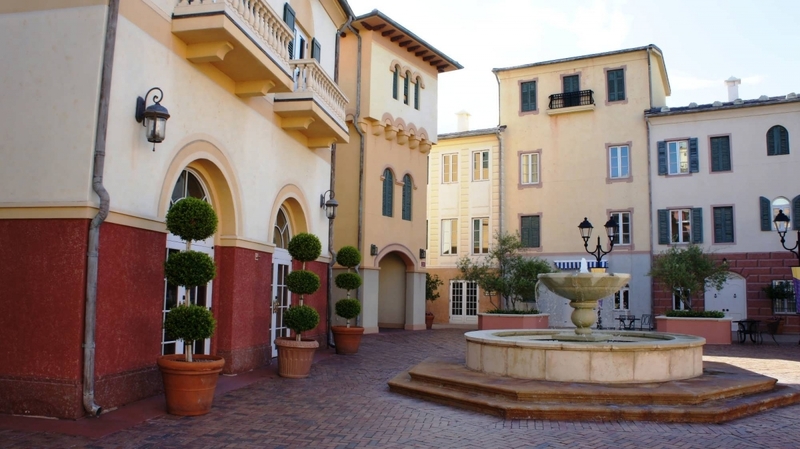 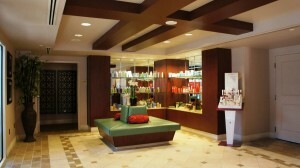 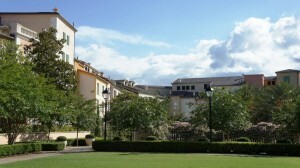 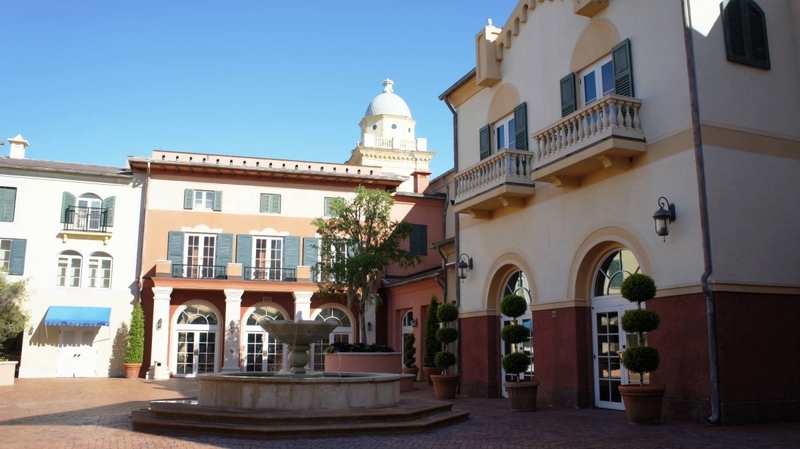 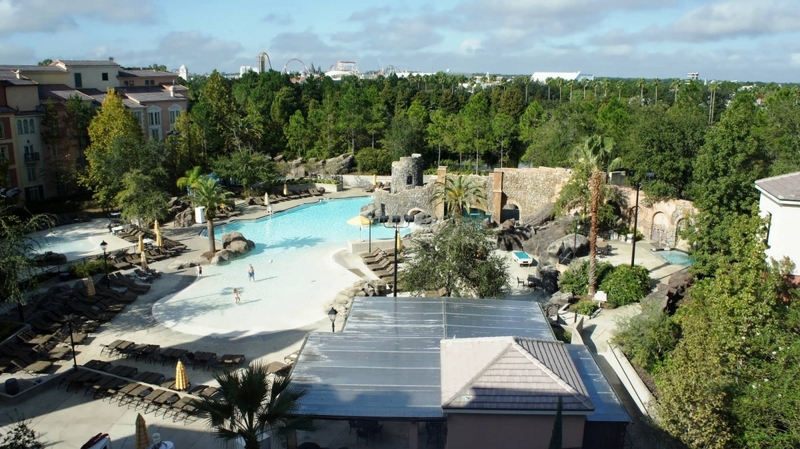 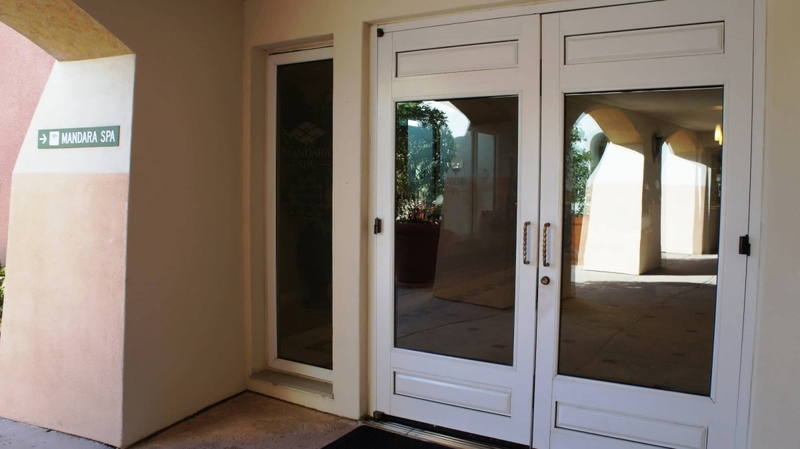 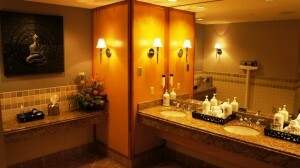 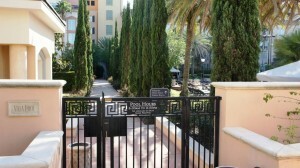 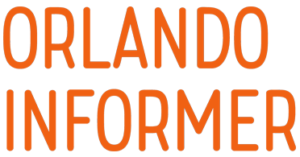 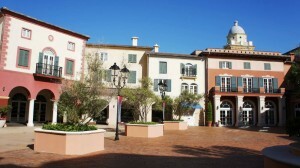 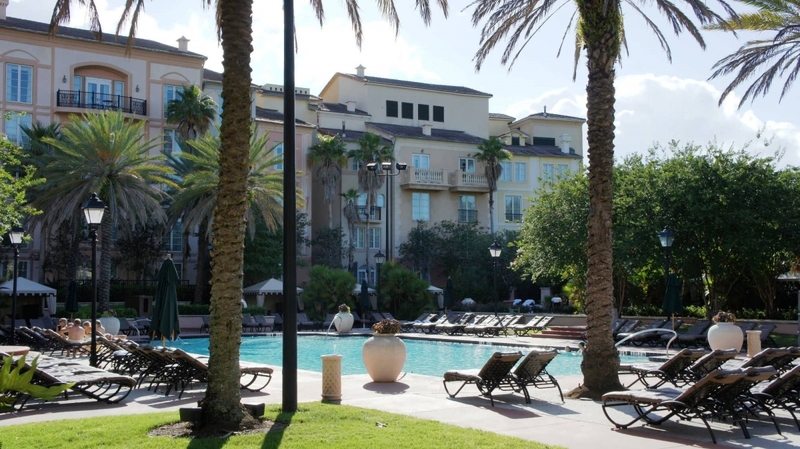 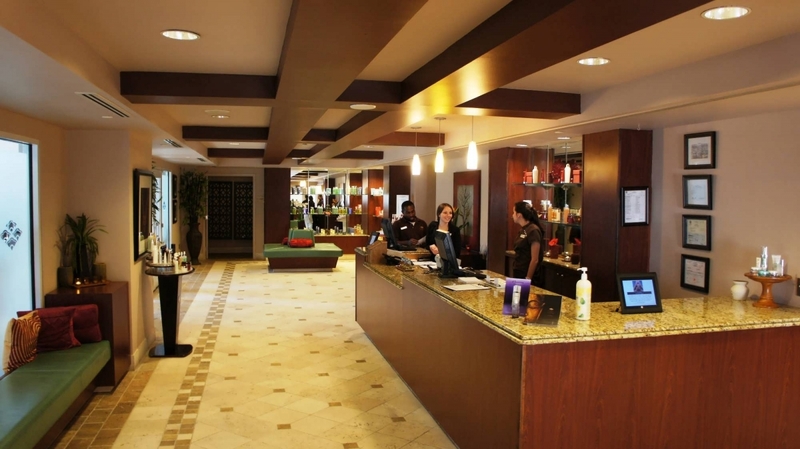 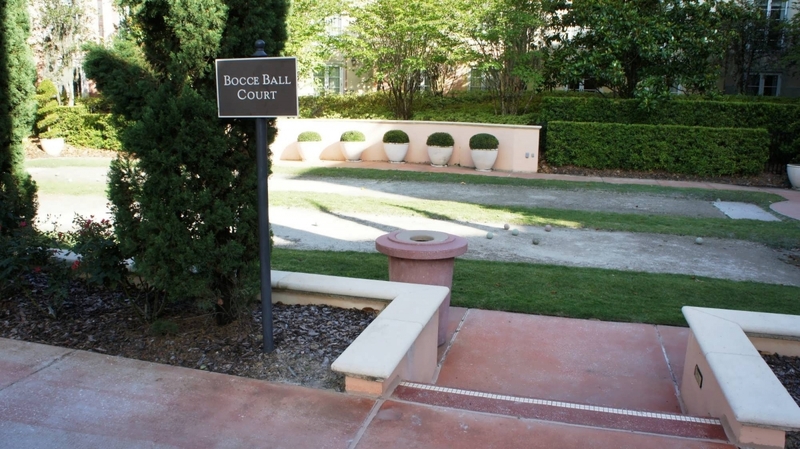 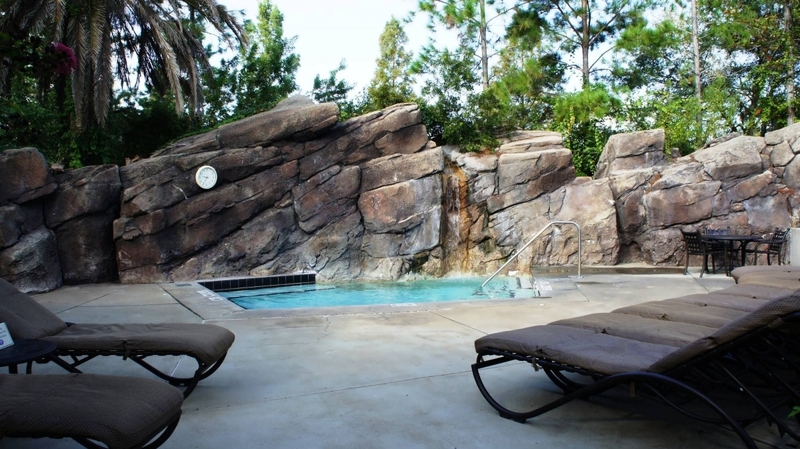 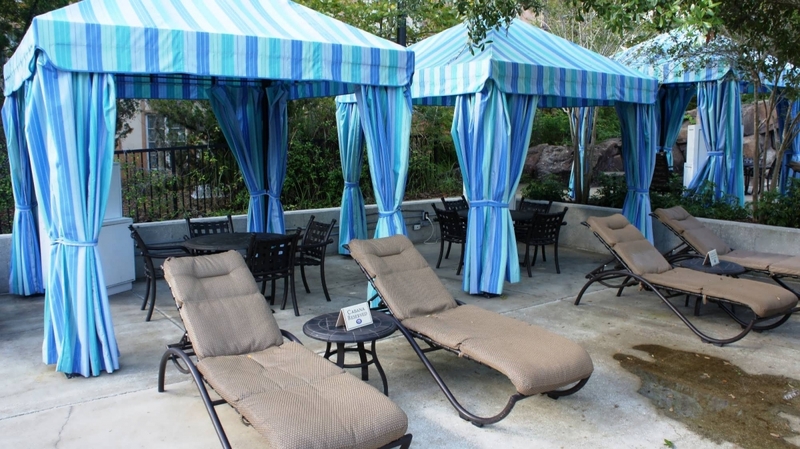 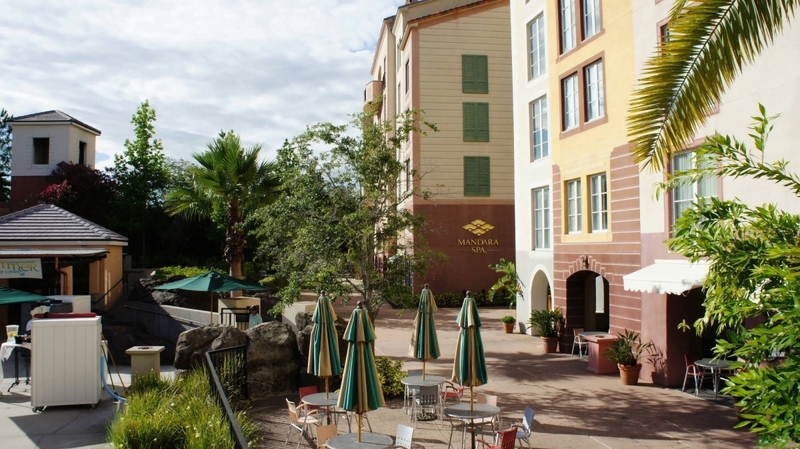 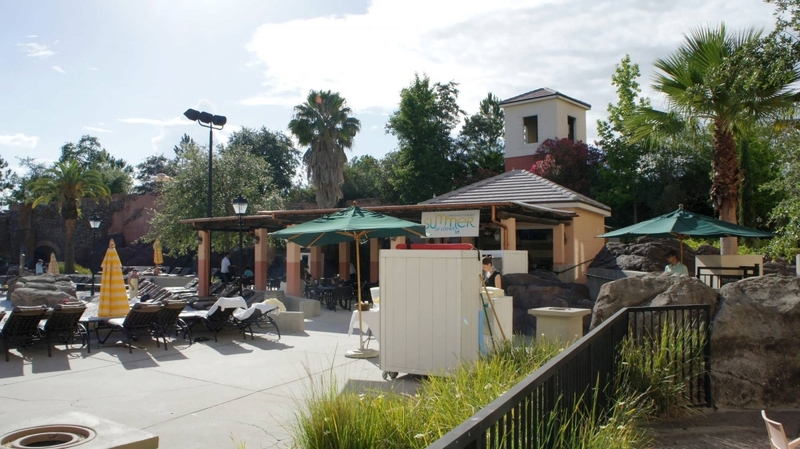 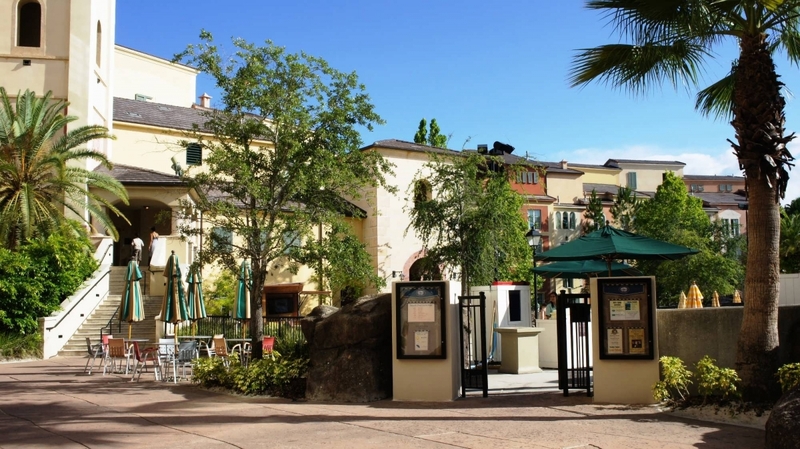 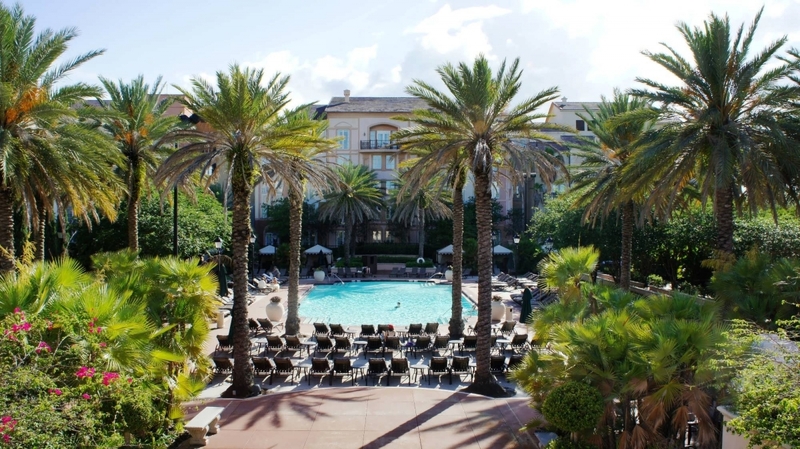 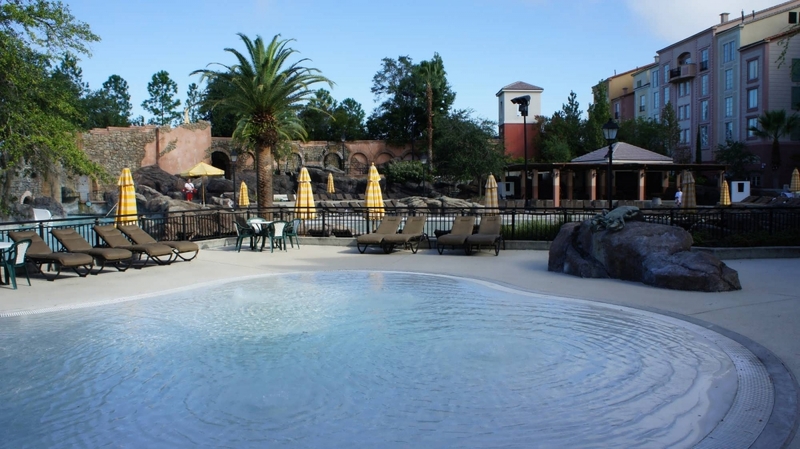 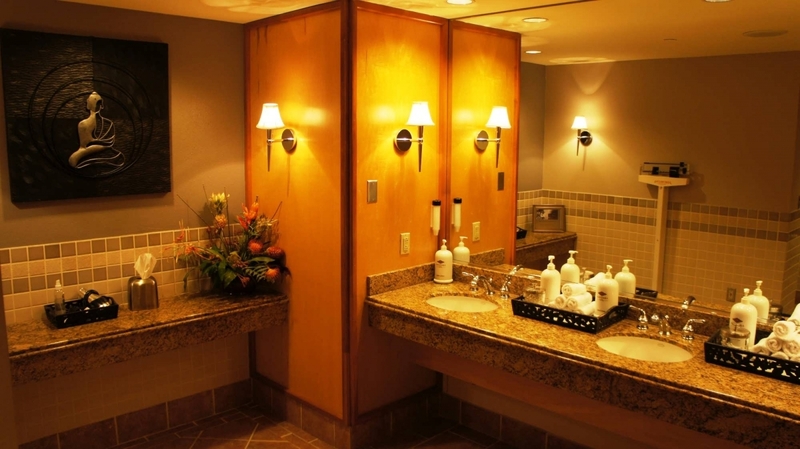 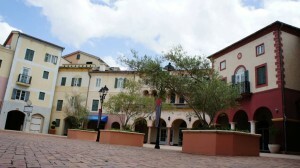 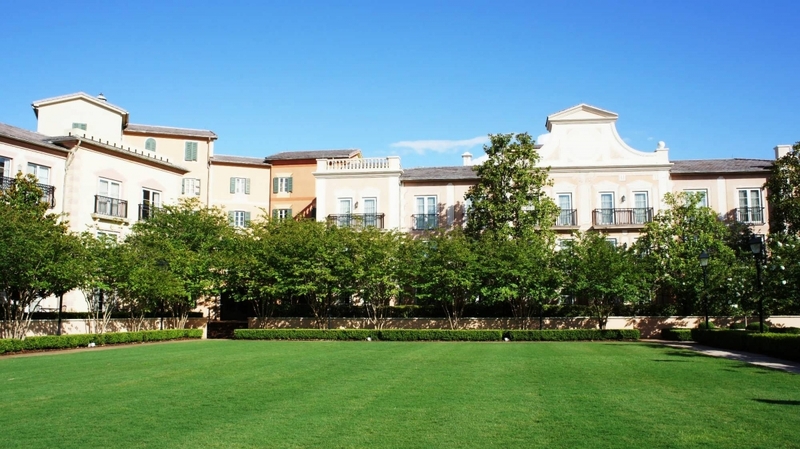 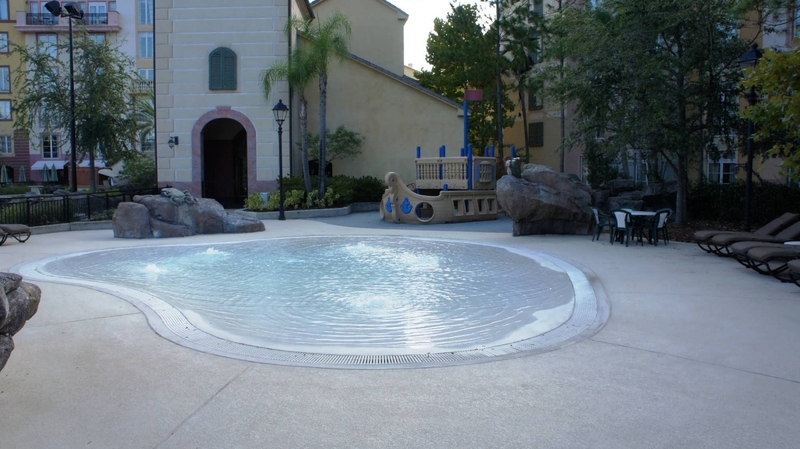 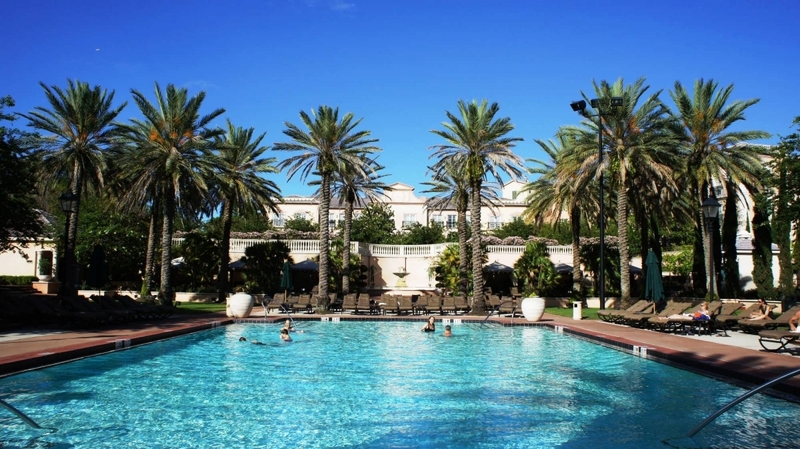 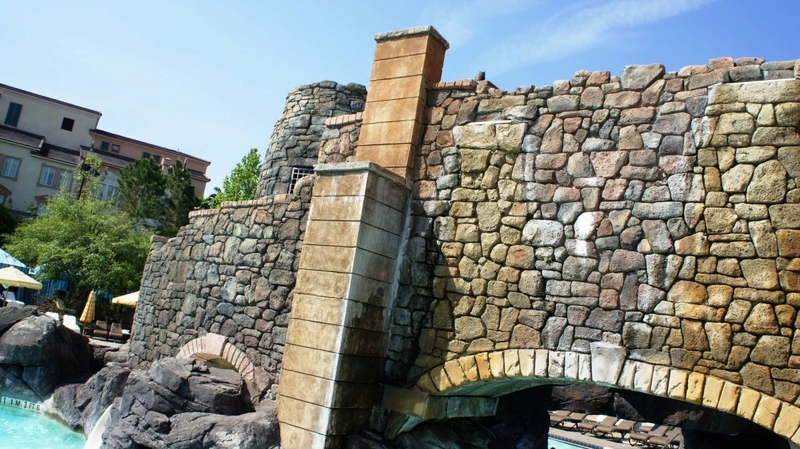 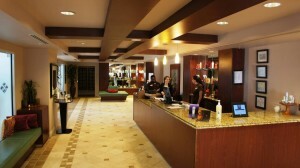 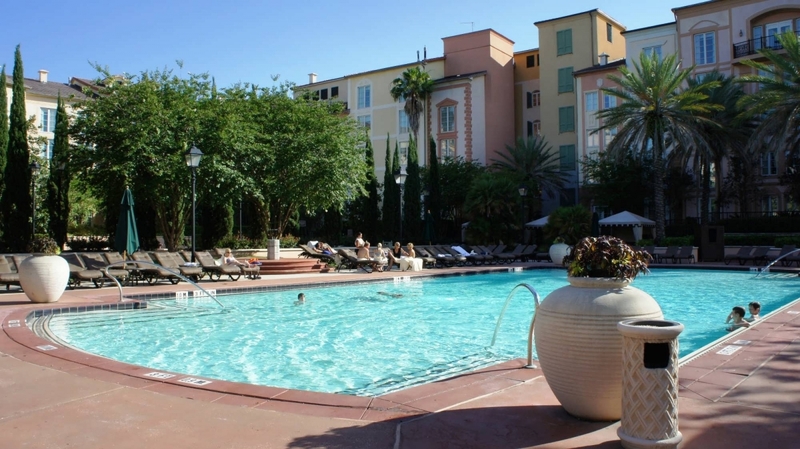 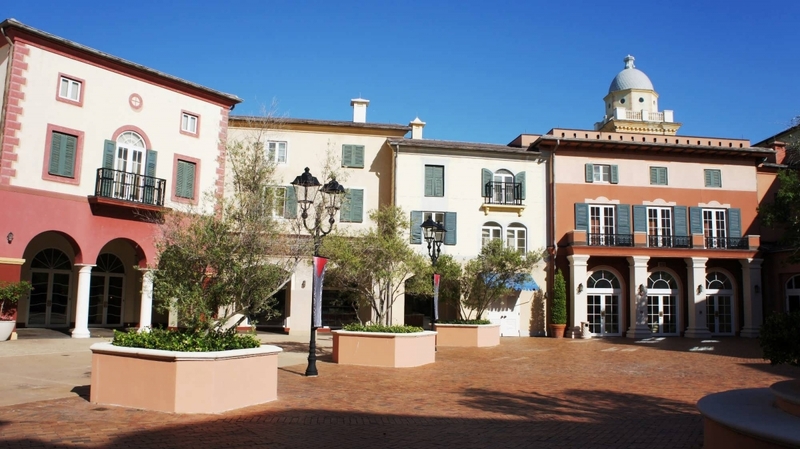 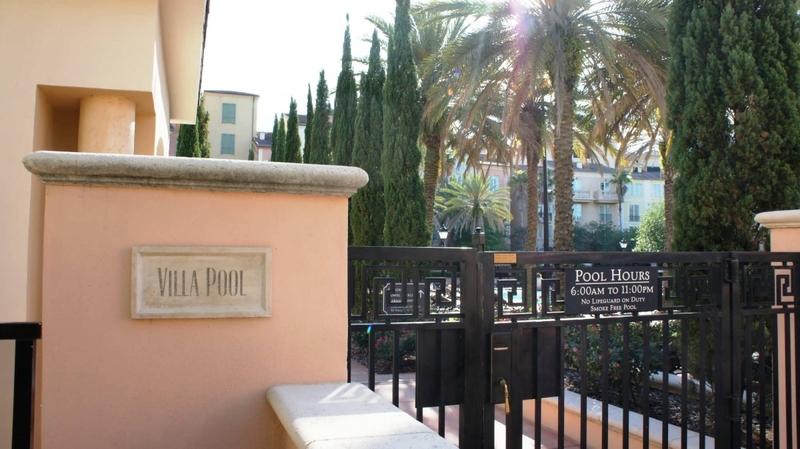 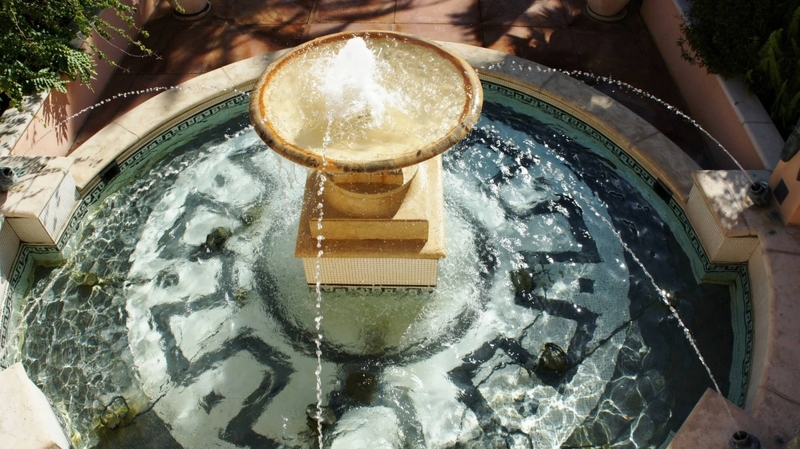 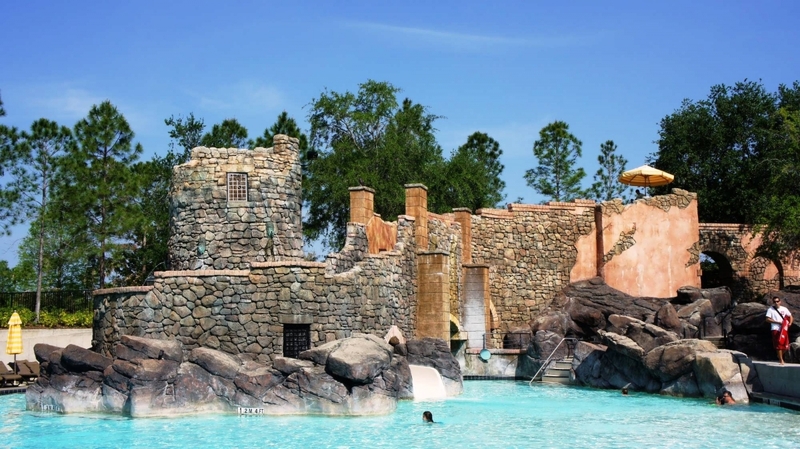 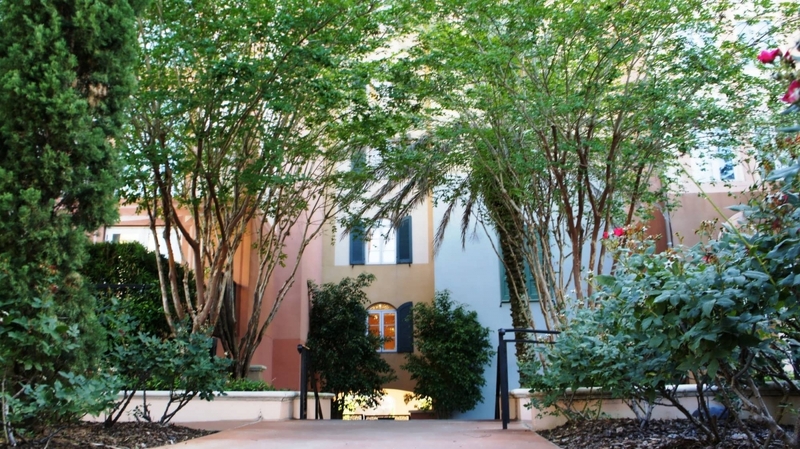 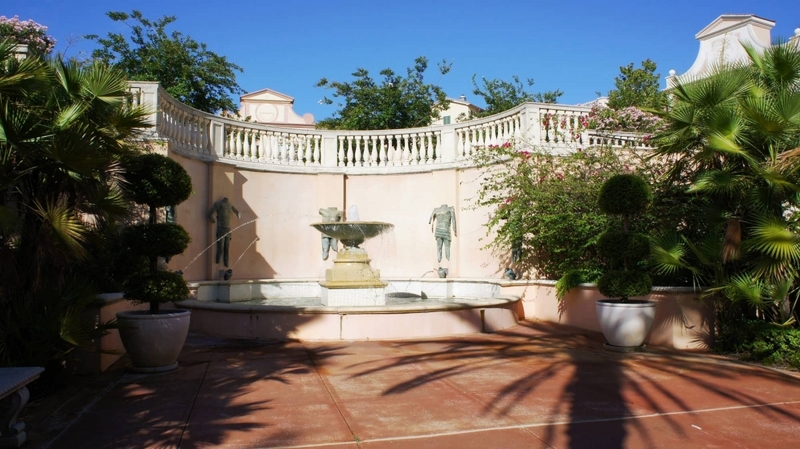 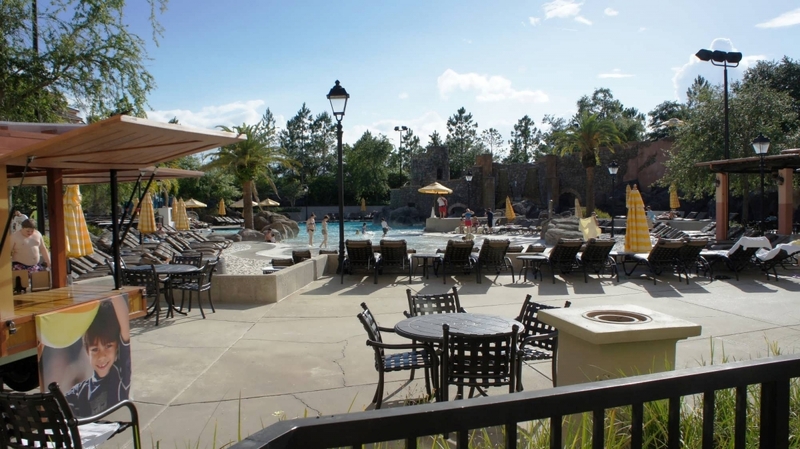 This page features information on and an extensive photo gallery of Mandara Spa, the pool areas, and the smaller piazzas at Loews Portofino Bay Hotel, one of three premier on-site hotels at Universal Orlando Resort. 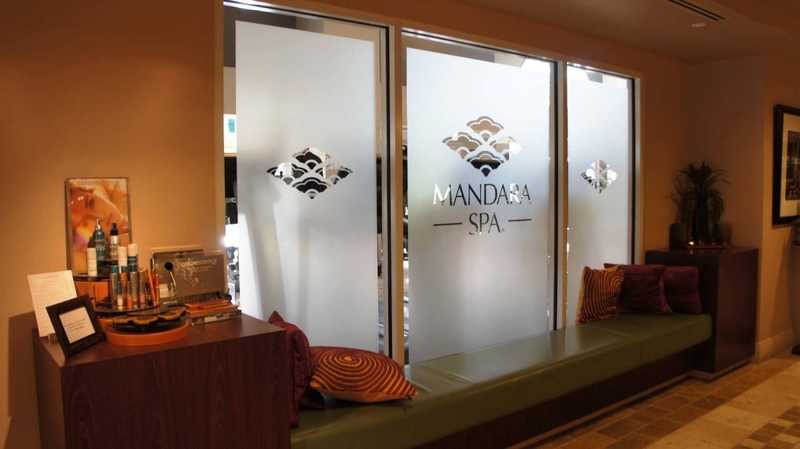 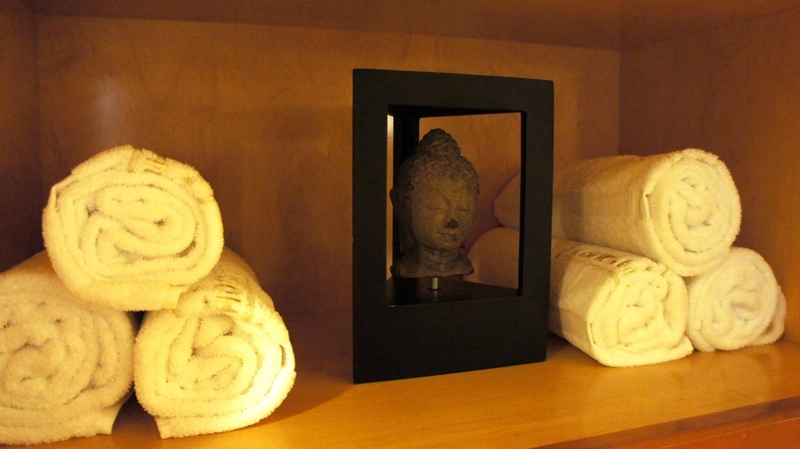 The Mandara Spa is a sanctuary where you can relax and discover the elixir of youth, not as a goal but as a moment of blissful reverie. 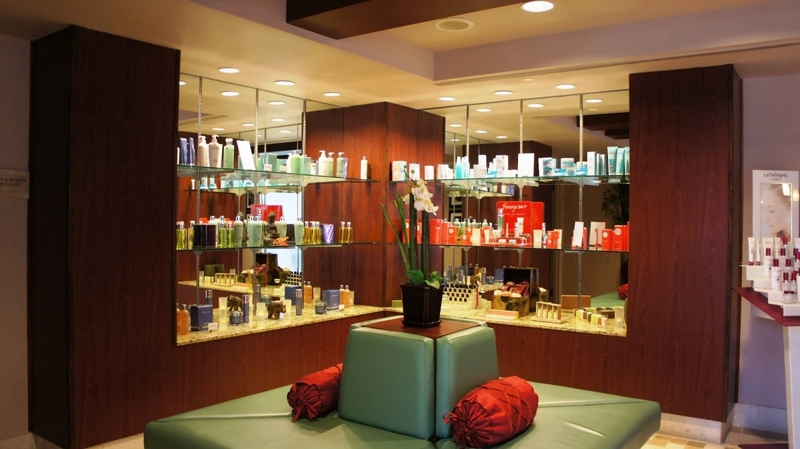 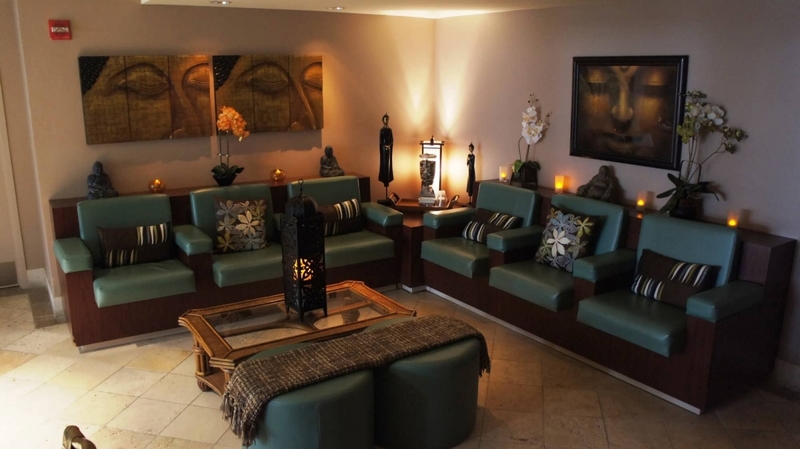 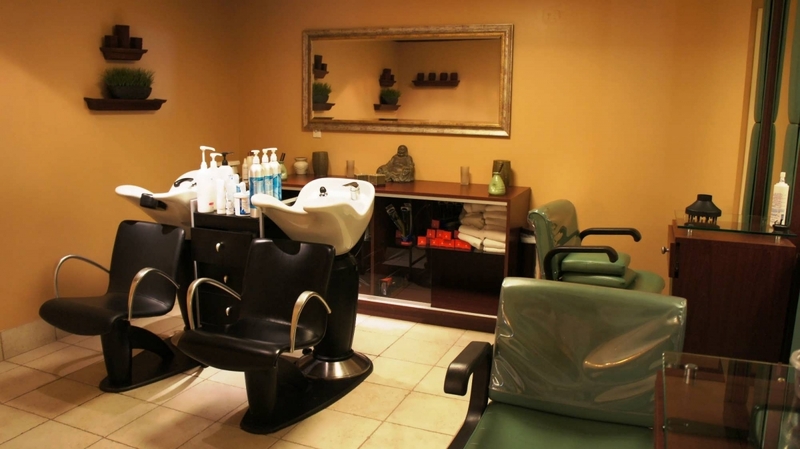 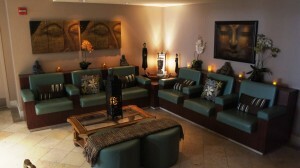 Spa services include massage, skin care, beauty, body treatments, hydromassage, steam and sauna, lounges, refreshments, and hair and nail care. 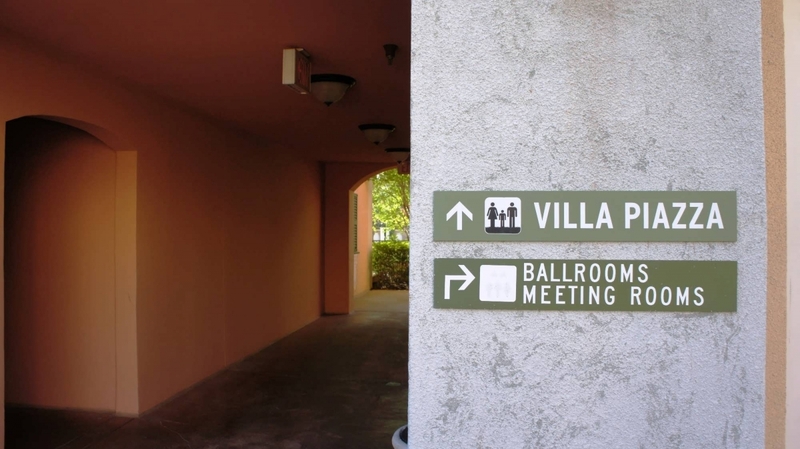 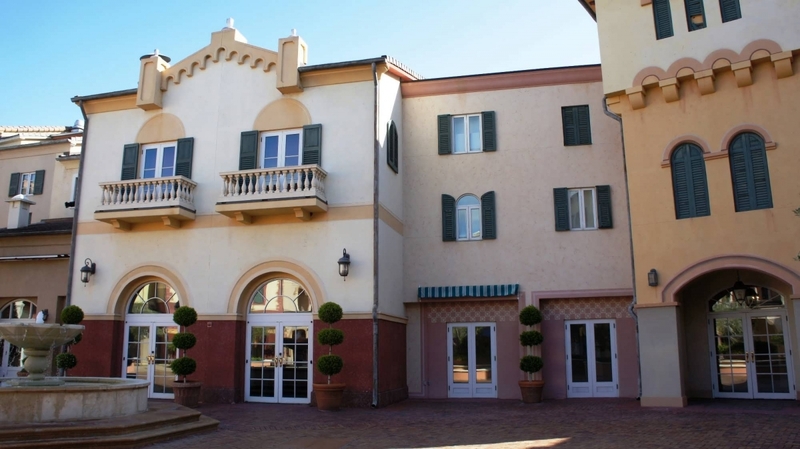 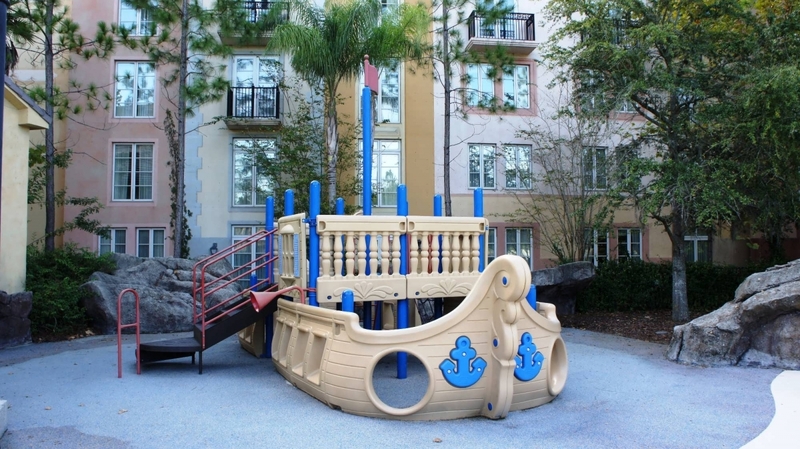 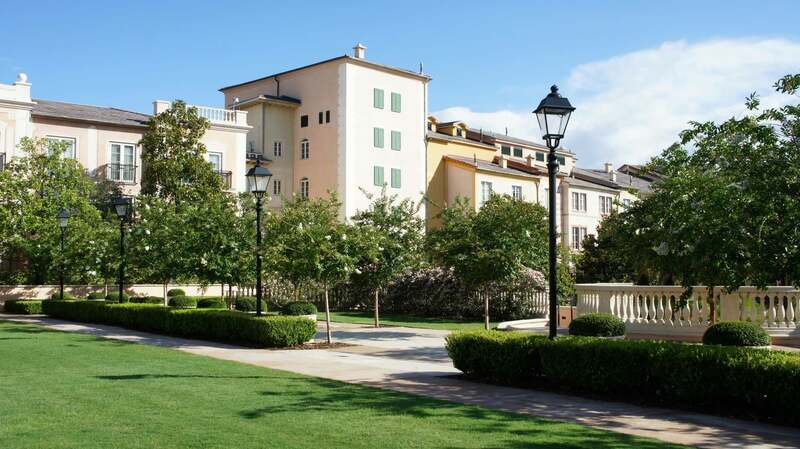 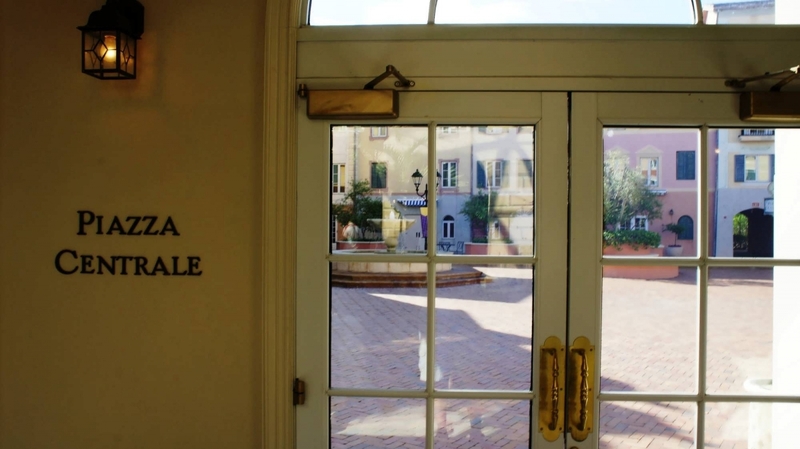 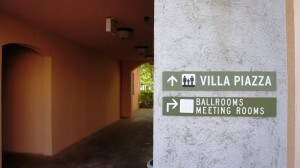 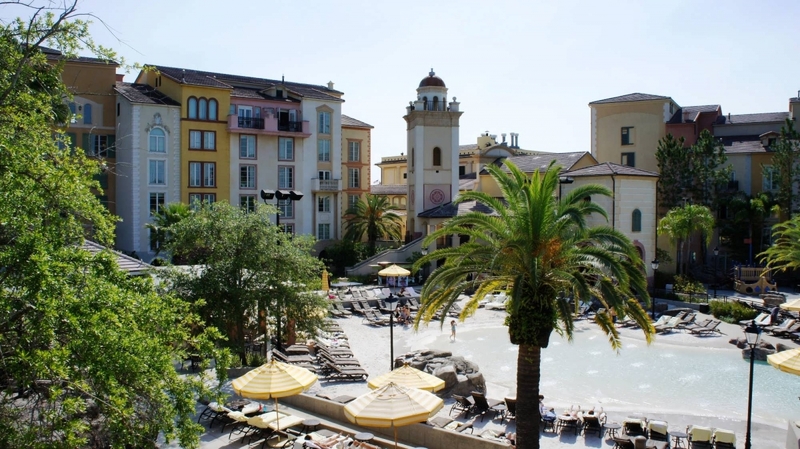 Portofino Bay guests can also request in-room massages, but there is an additional $60 charge, and only same-gendered masseuses will be dispatched. 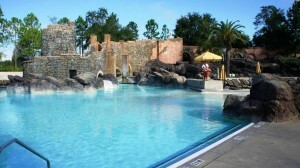 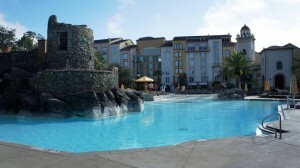 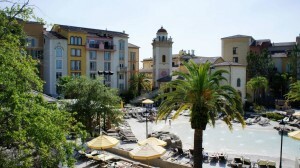 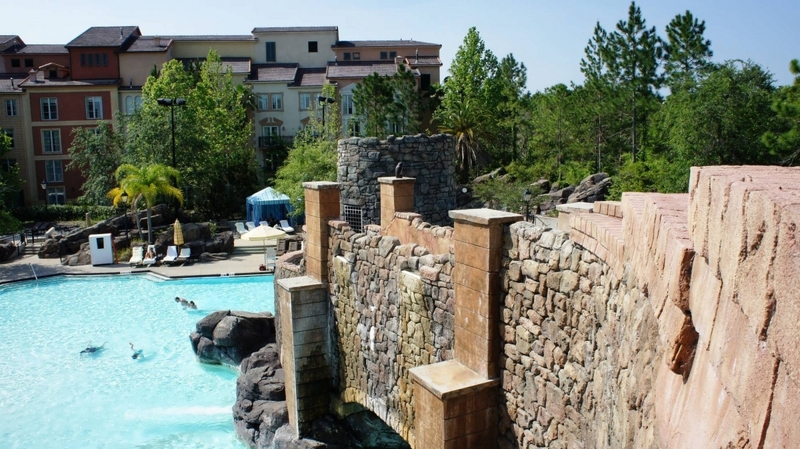 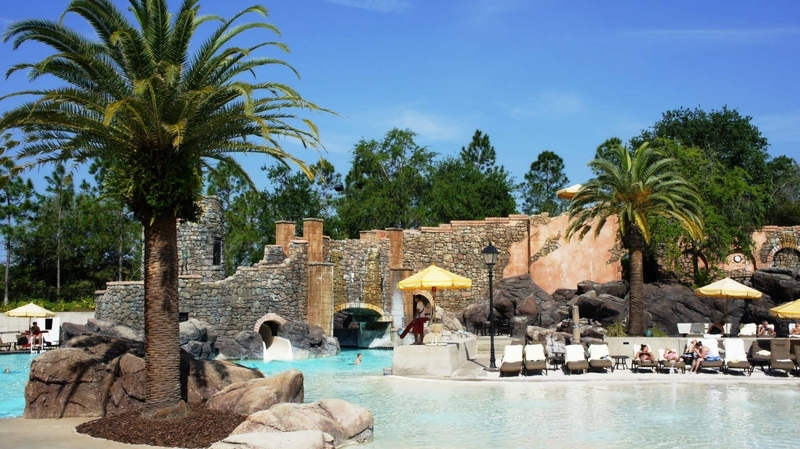 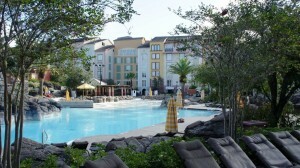 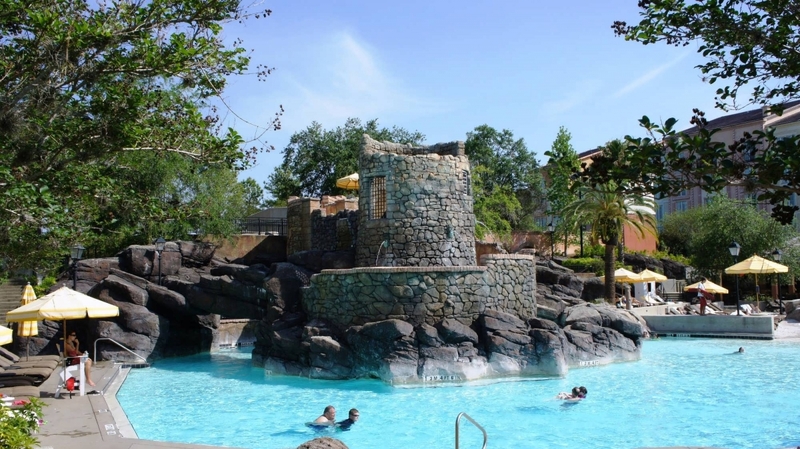 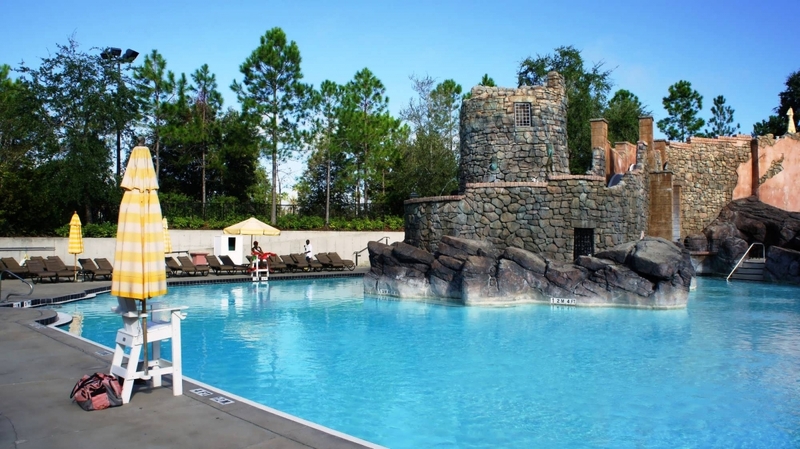 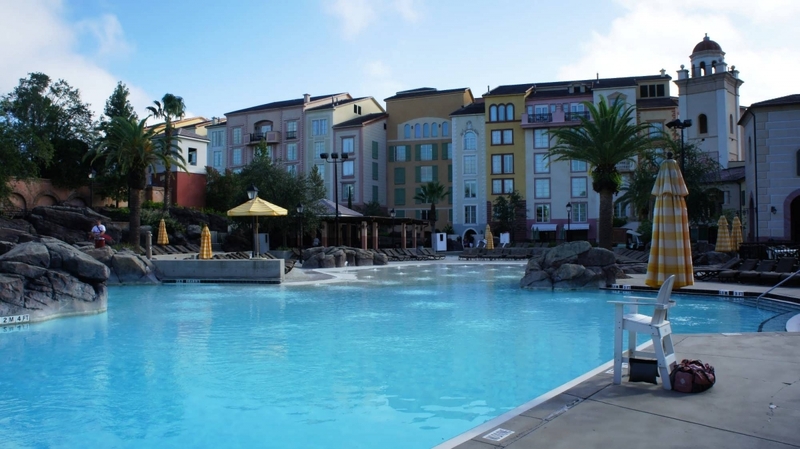 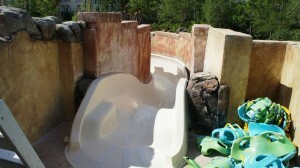 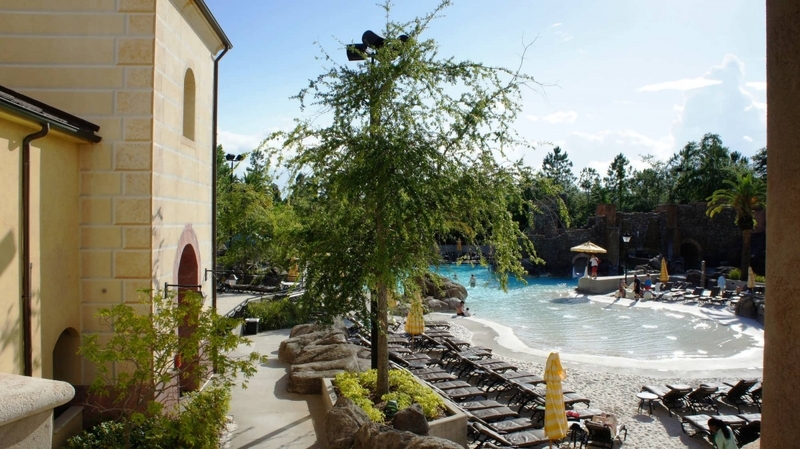 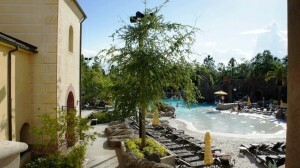 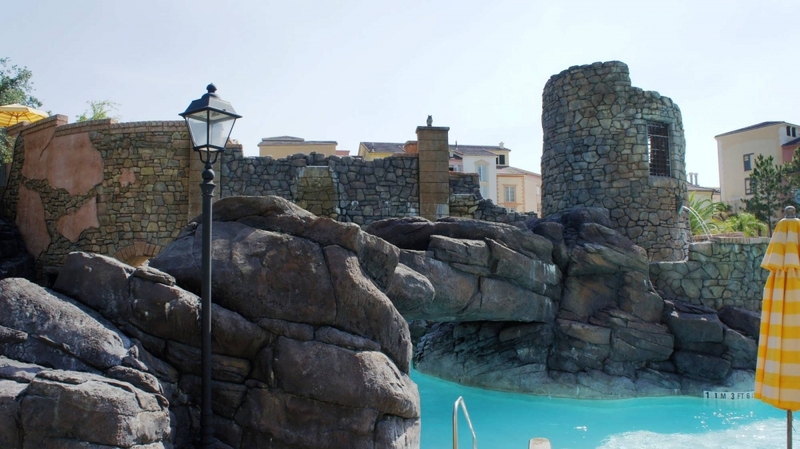 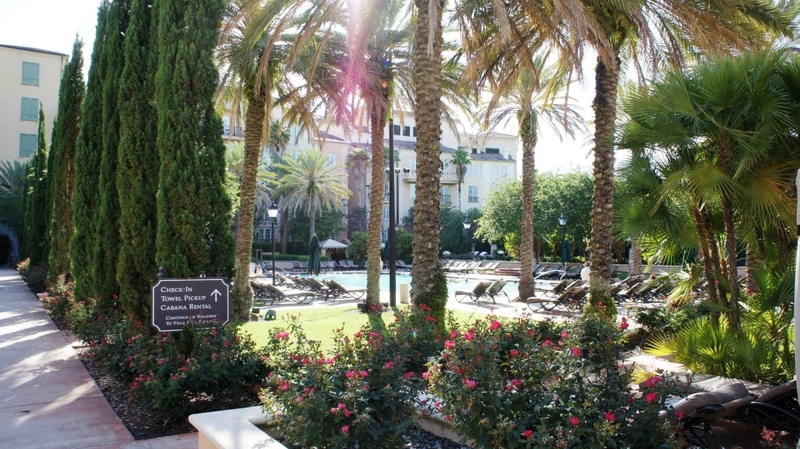 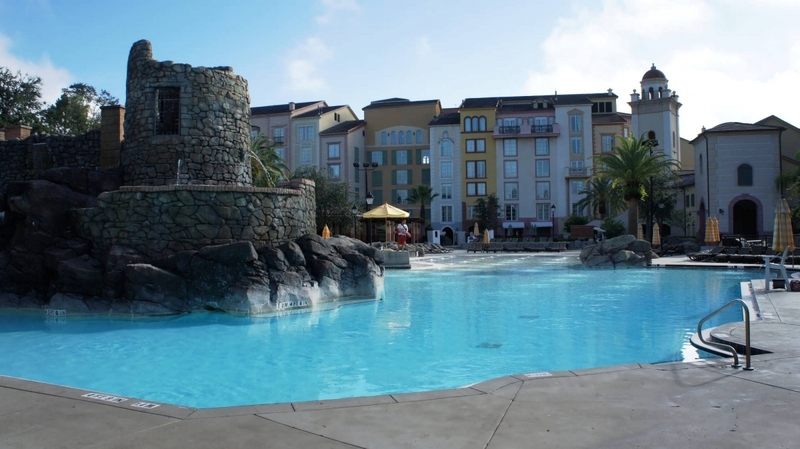 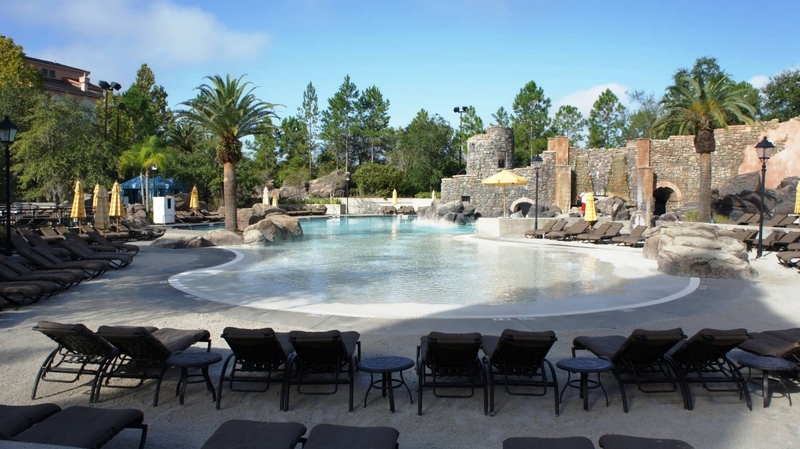 There are three pools at Portofino Bay Hotel: Beach, Villa, and Hillside. 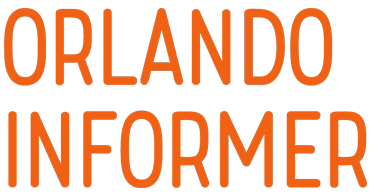 We’ll cover each in-depth in just a moment, but first we wanted to get some general overview information out of the way. 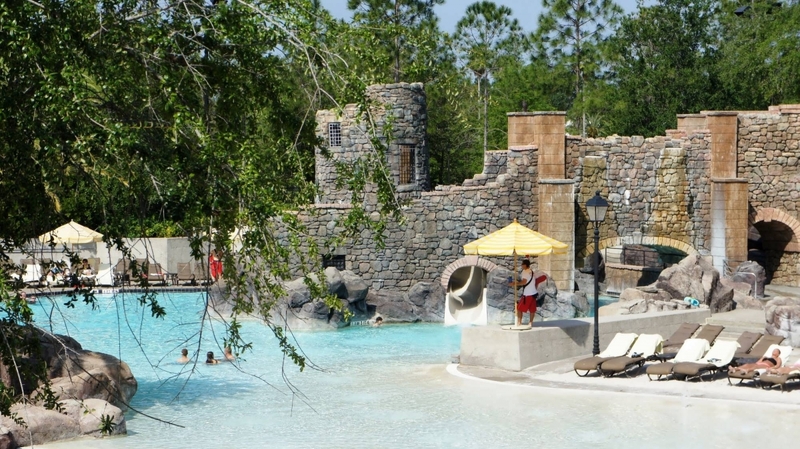 The Beach Pool is the ideal place for the family to spend the day together — enjoy a Roman aqueduct-themed water slide, a sandy beach, and relaxation in the sun. 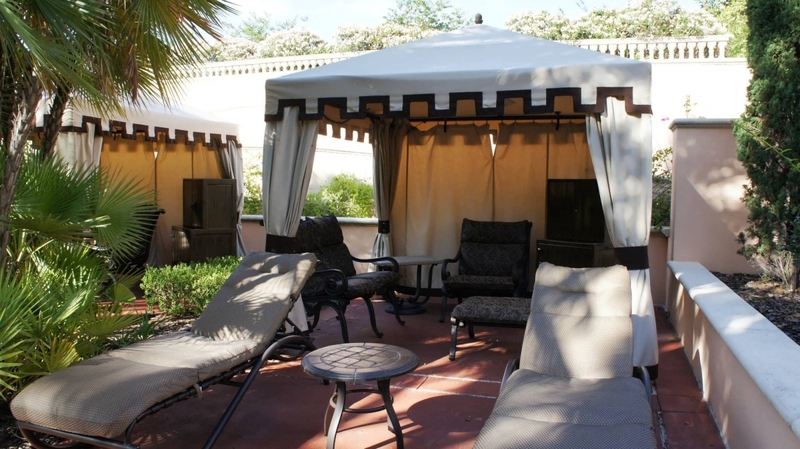 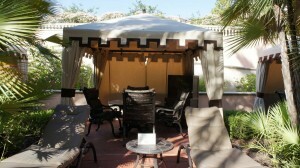 Cabanas are also available for rent, though they are limited. 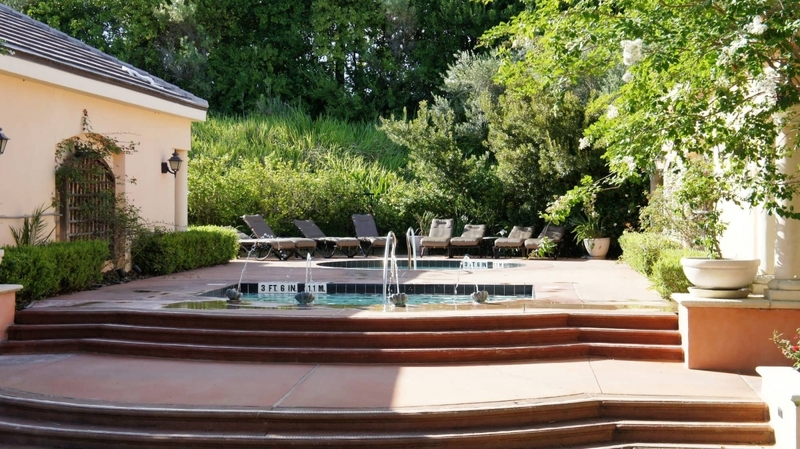 Offering more exclusivity with upgraded amenities and lounge chairs, the Villa Pool is the perfect place to relax for a couple of hours… or the entire afternoon. 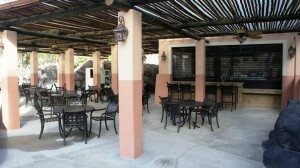 Cabanas are also available for rent here, as well. 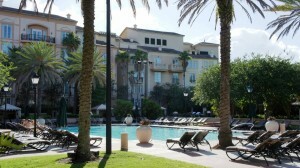 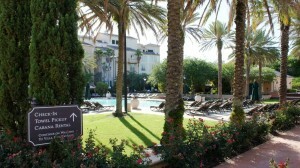 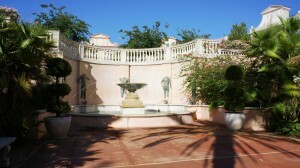 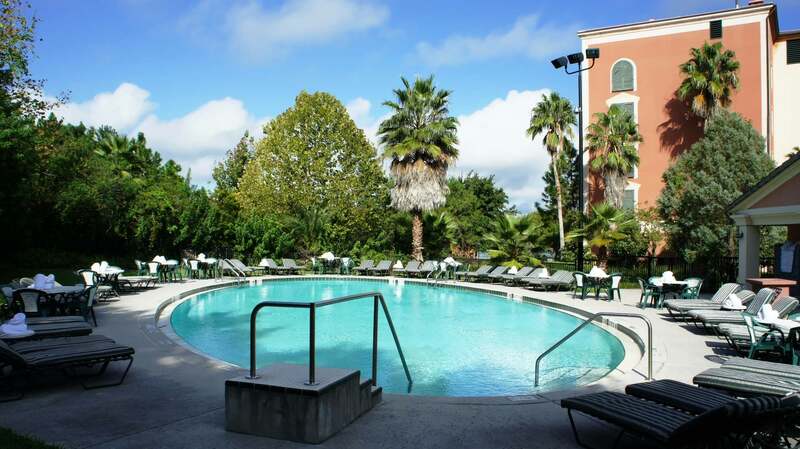 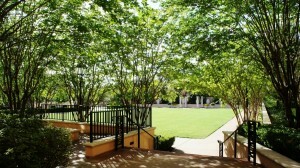 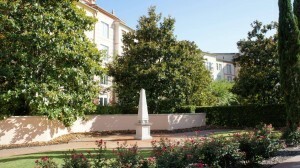 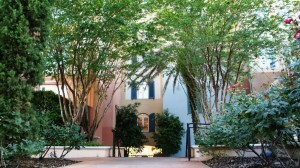 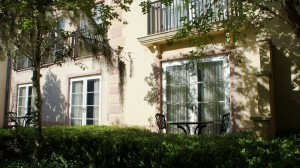 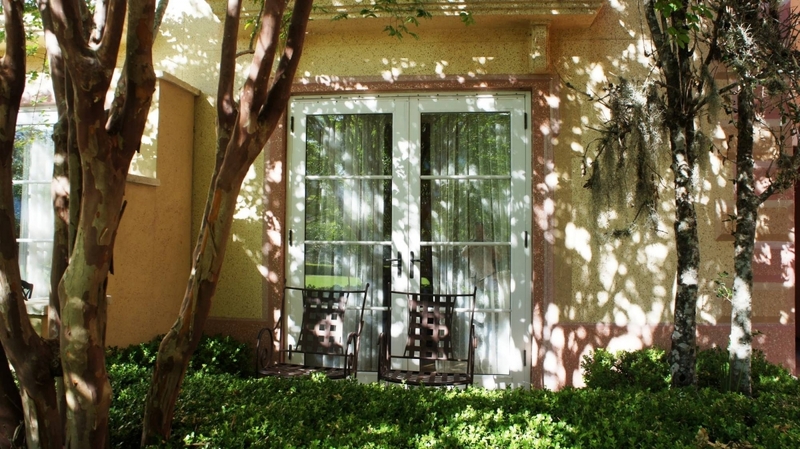 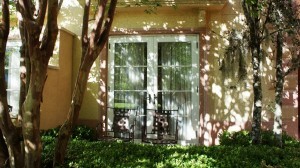 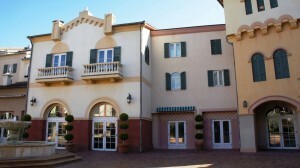 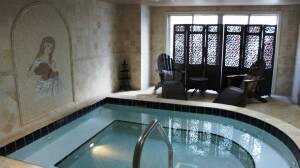 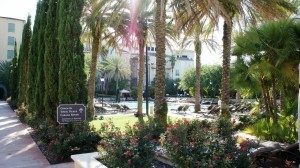 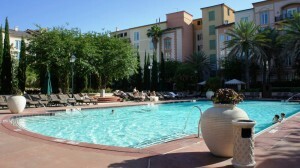 Portofino offers another pool on the east wing of the hotel, offering a quiet place for contemplation and more privacy. 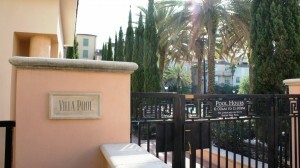 The Villa Piazza looks over the Villa Pool. 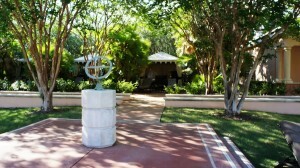 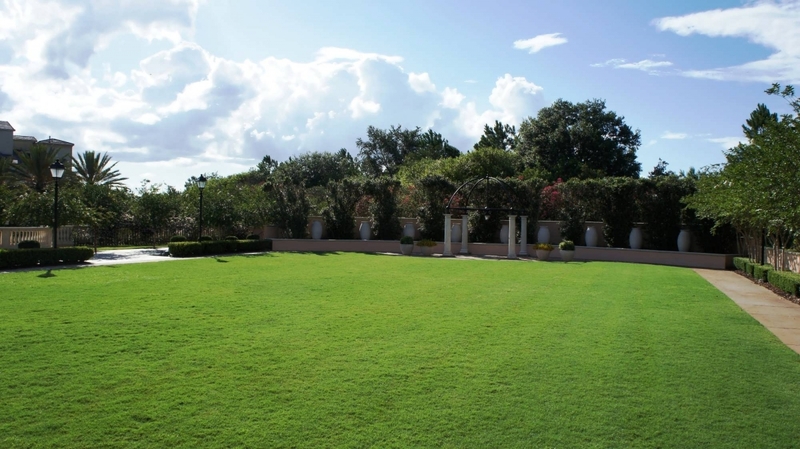 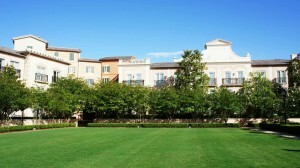 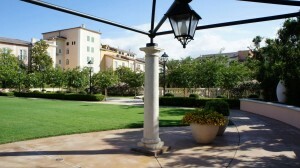 This serene area offers a beautiful Italian countryside setting for outdoor gatherings and celebrations. 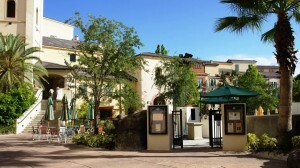 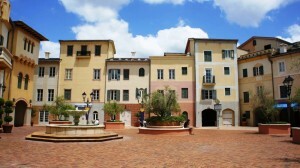 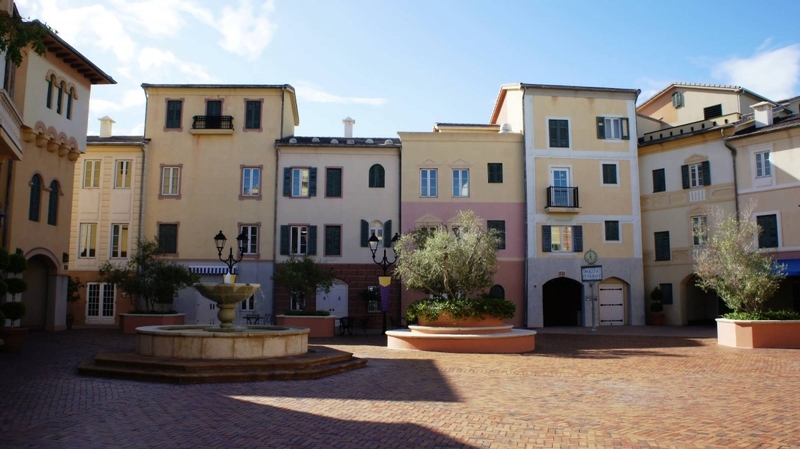 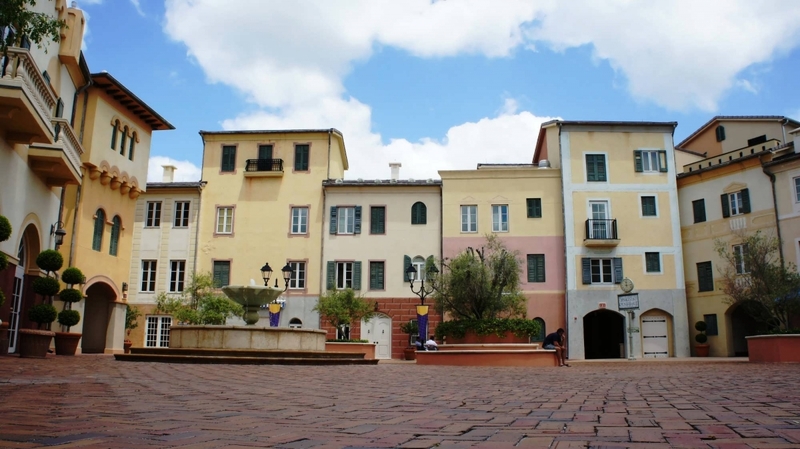 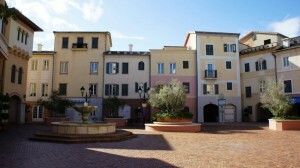 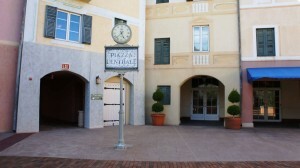 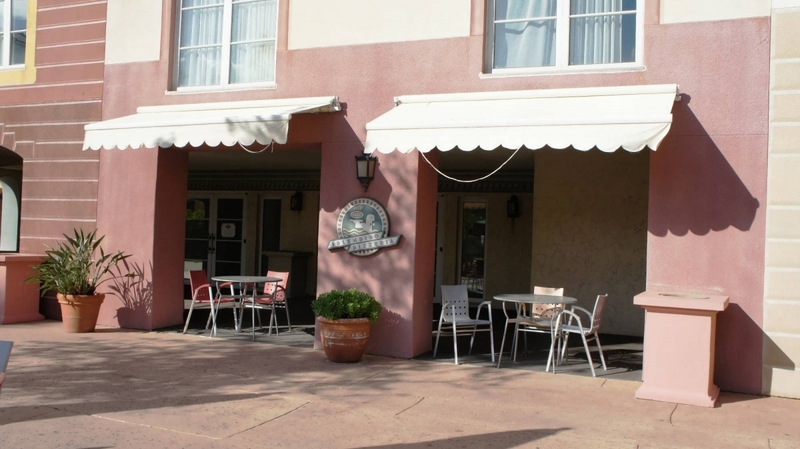 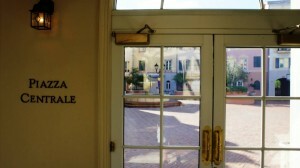 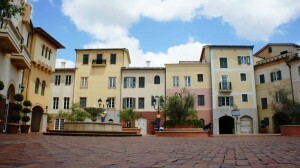 Located just off the front desk and lobby area, the Piazza Centrale embodies the spirit of a small Italian village center square.